Published: June 2008. Last Updated: April 2011. Source: UNAVCO for Data For Educators site. Click on Image for larger view. 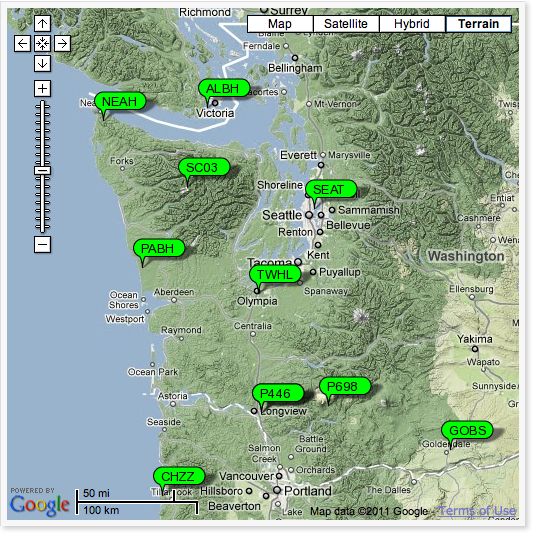 In this chapter, you will access Global Positioning System (GPS) data from the Plate Boundary Observatory (PBO) and analyze the data in a spreadsheet to measure the motion of GPS stations in the Pacific Northwest. From your analyses, you will generate and map annual velocity vectors of GPS stations. Finally, you will explore patterns in the direction and length of velocity vectors on the map to understand tectonic motion and surface deformation associated with the subduction of the Juan de Fuca plate under the North American plate. From an easy-to-use map interface, you can access information about GPS stations and the data you collect. You will learn about the network of GPS monuments and how position data collected at these sites are analyzed to reveal plate motion. The activity provides complete instructions for calculating north-south and east-west velocity vectors for a GPS station and combining them to produce a vector that represents the annual horizontal motion of the station. After plotting velocity vectors on a map, you will be asked to examine the pattern of direction and lengths. With first-hand experience in producing and mapping station velocity vectors, you will be better prepared to use the patterns to interpret regional geology.